Sometimes what you know is enough to get on and have a good time. But you do need to be in the know. It goes without saying that if you don’t know there’s an event happening on your doorstep, you’re certainly not going to get to enjoy it. Other times it’s not what you know but who you know that might be able to open a few doors and bag some free or top notch tickets. And then there are the times when it all comes down to how deep your pockets are. This suite of events happening in July 2016 all have a poor man’s and a rich man’s entry option. There’s always a high society ticket but don’t let that rule them out. Rich man, poor man, beggar man, thief. With the exception of the latter, be there or be square. What: The world’s most acclaimed international amateur rowing regatta. This riverside market town becomes a global stage for the world’s elite athletes. But let’s be clear, ‘elite’ in this sense means supreme fitness and sporting skill. Rowing may still largely be the preserve of private schools (because how many state schools do you know that own their own rowing lake? ), but as a pastime rowing is open to all. How: if you’ve raced at Henley Royal Regatta you’re entitled to apply to become a Steward (although there is a queue) and that limited group of individuals is entitled to buy tickets for Stewards’ Enclosure (think collar and tie, blazers and dresses below the knee). The enclosure tracks the last (and most exciting) 250m of the racing. If you’re not a Steward and don’t know anyone who is, head to the Regatta Enclosure. You have to pay to get in, dress code still applies (albeit a little more relaxed) and kids are allowed in. Warning: the Pimms is still extortionately pricey. So those enclosures keep the last 500m ish of racing under wraps (a privilege of sorts). But this is a 2,100m course. The rest of the towpath is lined with bars, restaurants, stalls, play areas and portaloos, so get as dressed up as you like or sling on your flip flops and pack a picnic (and your own Pimms). From the starter’s gun (and the stretch of water beyond used for race warm up) you can see the world’s top rowers doing their thing and you’re rarely more than 20m away from them. If it rains, watch it all on the Henley Royal Regatta YouTube channel! In the oft repeated words of Sir Matthew Pinsent last weekend: Attention. Go! What: Two days of adrenalin fuelled horseplay with long mallets combined with some of the classiest beach parties (that’s not to say things don’t get messy). Drawing beach polo teams from around the world to compete for the title and look on agog at the charity event (this year’s involves a pony and a Porsche). As social occasions go, this event is doing a fine job of bringing together the traditional and the new. 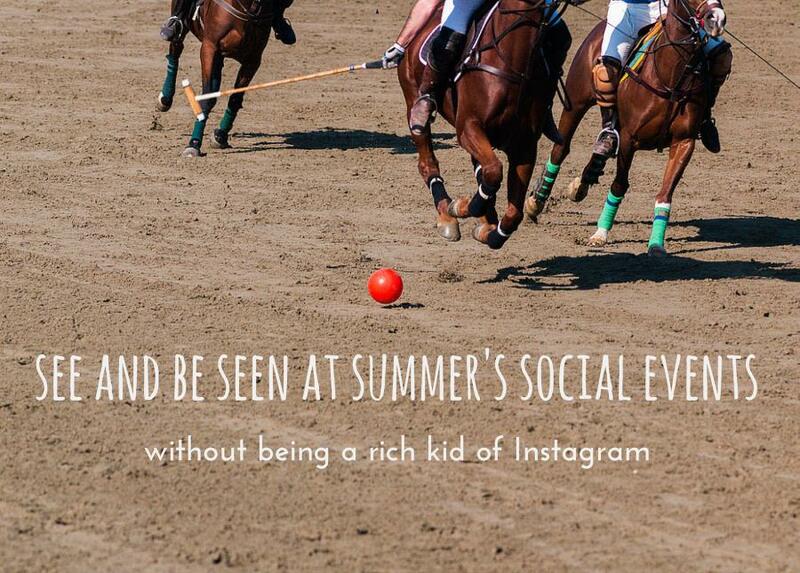 2016 is the 9th affair and bringing polo to the beach is both quite American and not very upper class English. So if anyone tells you that the British Beach Polo Championships take place in Poole, they’re definitely attempting to shake off the traditional high society associations of the sport. How: If you’re a little intrigued you can grab grandstand tickets from £25 to watch and learn the rules of the game, and soak up a passionate and gung-ho atmosphere. For twice that price you become a VIP with access to the Champagne bar until the early hours. Or you can splash the cash on chauffeurs and hospitality packages, knock back oysters and Champagne on Daddy’s Amex, and wait for a sweaty polo player to wander past for a sneaky selfie. Tally ho! What: in the simplest of terms, a three day triathlon. In reality, this is one serious endurance event with each day dedicated to one of the disciplines: Friday swim from Tenby’s North Beach, Saturday cycle and Sunday run through undulating rural Pembrokeshire. Sounds easy enough breaking them up over three days until you realise this is a warm up for Ironman Wales. How: Less of a spectator event and more of wear your race number and get going activity (unless you’re the support team for one of the 7,000 crazy entrants) but this is still elite athlete territory. So who knows who might be in the area for a spot of hobnobbing. There are events each day for 4 year olds upwards, so this is a fabulous family event. But for grown ups be prepared to swim 2.4 miles, cycle at least 70 and run 26.2 (that’s a marathon to you and me). Goggles on and they’re off. What: in the words of Jenson Button “All the thrills, excitement and noise of a Grand Prix, but in the air”. The Royal International Air Tattoo has the seal of royal approval (this year the Duke & Duchess of Cambridge will be there) and showcases the aircraft of some of the world’s most prolific air force squadrons. The airfield hosts hundreds of aircraft during the event. You’ll see display after impressive display from all sizes of craft while wandering the length of the runway seeing the rest. Some aircraft are open for clambering into and meeting the pilots, and there are always simulators available for those with wilder imaginations. What: England’s international grass court tennis championship and one of the contributory tournaments to the international tennis grand slam. Professional tennis players only – this is tennis at its best. Watch out for the wild cards. Practice your pronunciation of some of the world’s tongue-twisting surnames. Work your neck muscles while eating (expensive) strawberries and cream. How: enter the ticket ballot (now for next year) if you want to be in with a chance of bagging any tickets at all. Although no promises on the court you’ll get tickets for. Or rock up and park your bum on Murray Mound, formerly Henman Hill (because us Brits are a bit fickle about who’s in favour from one year to the next). If, like this year, the rain stops play and Peoples’ Sunday opens the floodgates for middle Sunday ticket sales, you need to be quick with your fingertips and pray for fast broadband. Oh and most importantly digest Wimbledon’s very own ‘How to queue’ guide. Game, set and match! What: the 145th Open Golf Championship is the legacy of some of the 19th century’s finest golfers who created an event to crown the Champion Golfer of the Year and in its second year made it an international competition. Played on a different links course each year, 14 courses have played host to the championship over the last 150 years. The Open Champion is awarded the Claret Jug, first presented in 1873, and the previous year’s winner presents it to each new champion. How: you need to buy a ticket but under 16s get in free and if you opt for a practice day it’s a lot cheaper, typically quieter and much more relaxed. Once you’re in, there are 18,000 grandstand seats around the course but a whole lot more people than that attend. So let’s be realistic here, the course stretches and meanders leading the players on a 4 or so mile walk. You’re going to be on your feet and out in the elements – you’ll need a brollie and sun cream. You can leave luggage in the Spectator Village but keep your phone on you – The Open app is invaluable. Four! What: a battle between the world’s best sailors on the fastest boats that includes Britain’s greatest ever competitive sailor, Ben Ainslie. Watch his crew battle it out over two days of racing and during their downtime look up to the skies for the daily air shows from Royal Air Force acrobatic and display squadrons. How: there are a handful of free-to-access spectator areas but if you really want to be able to see what’s going on, various ticket levels will get you access to the Race Village for £25 or the Grandstand for £60. There are pricier tickets and hospitality packages available if you’re that way inclined. All aboard! Now we’re all a bit exhausted even thinking about these events, but with the stilettos firmly parked in the wardrobe we’re off to find the picnic hamper. Jolly good show.